If you’ve already glanced at the reviews I have for you below, you will notice that pull down faucets come in all shapes and sizes. There is also a good deal of choice when it comes to design. 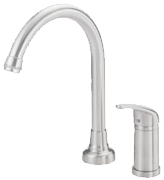 However, a pull down faucet is more than likely going to suit you better if you have the room for a spout that will arc higher than other models. The reason for this is pull down faucets are ideal for deeper sinks. Plus, when you use the hose there is no “messing” around with trying to manoeuvre it into the correct position. It simply slides straight down for easy pot filling or rinsing. Hopefully you’ll find what you’re looking for below.